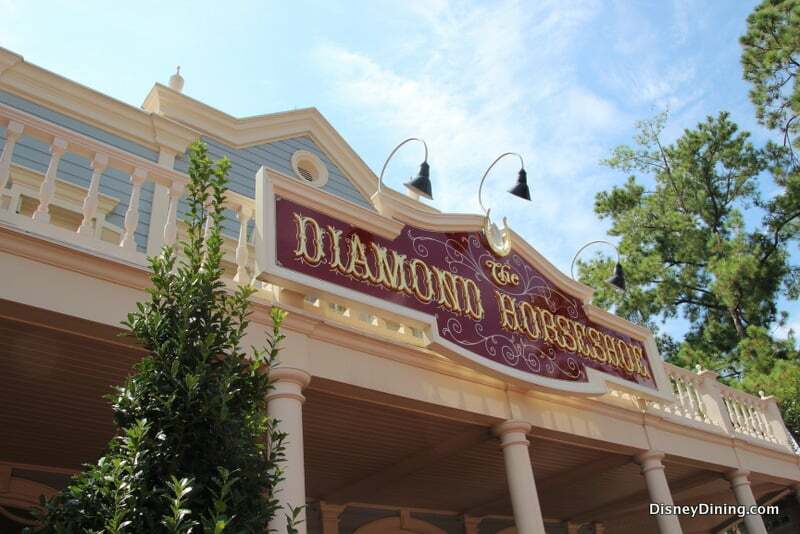 If you are visiting Magic Kingdom at the Walt Disney World Resort in Florida and find yourself hoping to rustle up some grub, there’s no better place for you and your posse to take a load off than at the Diamond Horseshoe restaurant in Frontierland. Here are 8 reasons why you’ll love it! From the moment you approach the Diamond Horseshoe restaurant, you will get a sense of western nostalgia. The beautiful building that houses the restaurant is in the style of an Old West music hall or saloon. So saddle up and head on in for a rootin’ tootin’ good time at lunch or dinner. Until just recently, the appetizer at the Diamond Horseshoe was a Frontier Salad with cornbread croutons. But Disney has added some items to the mix, and now, Guests who choose to experience the all-you-care-to-enjoy buffet at the Diamond Horseshoe will enjoy an appetizer platter brought to their tables. The platter includes a mixed green salad, potato salad, jalapeno cornbread and a cucumber, watermelon and tomato salad. The main courses offered on the all-you-care-to-enjoy buffet are BBQ pulled pork, sliced roasted turkey, country smoked sausage, braised beef and grilled chicken. Sample some of each and share with the table. Don’t worry! If you clean your plates, your server will bring more out to you! The Diamond Horseshoe’s trademark Campfire Brownie—a brownie atop a graham cracker crust with toasted marshmallow on top—is no more. But don’t despair! If you like your dessert, you’re in luck because now, on the all-you-care-to-enjoy buffet, when it’s time for dessert, your server is only too happy to bring out a dessert platter. The planter includes buttermilk chocolate cake, peaches and cream cheesecake and blueberry cobbler. Not a bad trade! The Diamond Horseshoe restaurant has just recently added a new menu for Guests who choose not to experience the all-you-care-to-enjoy buffet. If you choose to enjoy the a la carte menu, you’ll have several options. Choose from a beef brisket sandwich, a pulled pork sandwich, a grilled chicken sandwich with BBQ mayonnaise and a turkey salad sandwich. You can also choose one of the desserts from the dessert platter on the a la carte menu. The service at the Diamond Horseshoe is stellar—and I’m not saying that just because my friend is a server there! It’s a nice perk at the Diamond Horseshoe—servers bring out food to the tables, even if you’re eating from the all-you-care-to-enjoy buffet. No getting up, getting a new plate, waiting in line, serving yourself and tripping over others to get back to your seat! It’s great! Not only will you love the new appetizer and dessert platters, as well as the option to choose from the a la carte menu, but many Guests will also appreciate the fact that the Diamond Horseshoe—like most table-service restaurants at Magic Kingdom—now serves wine and beer. So if you’re looking for an alcoholic beverage to wash down your grub, you’re in luck! Who wouldn’t want to have lunch or dinner in a place that brings back the spirit of the Old West—and with a Disney flair to it? If you and your family have a hankerin’ for some of the best grub this side of the Mississippi, your trip to the parks won’t be complete with a stop at the Diamond Horseshoe!